Welcome my readers, today i'm gonna to show you how you can add a stylish facebook like box to blogspot, which it will confer significant attractive to your blog. Whatever number of fans on your facebook page is a little bit, you'll see a noticeable increase in the number of likes, not say that number will rise to hundreds or thousands but as far as making your blog move to the next level..
Place this widget anywhere you want, i advise you to put it on your sidebar, it will catch the attention of your readers. 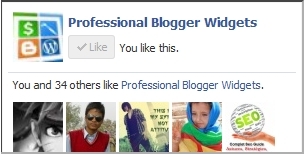 Share Your Posts And Add Beautiful Social Sharing Widget Below Every Post On Blogger. Increase Your Facebook Fans: Add Popup Facebook Like Box To Your Blog. Add 3 in 1 Floating Subscription Widget for blogger. Change Pro.widgets with your facebook username. If you don't have username for your facebook page then create your own here. And that's was all what i have today, hope you like this widget share it with your friends, put your comments below, if you get trouble or you have Qs! you are all welcomed, tel next time take care and happy blogging.